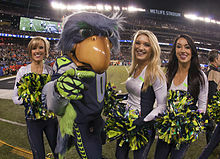 The Sea Gals are the official cheerleading squad of the NFL team Seattle Seahawks. Noted as one of the most intensely trained groups of NFL cheerleaders, the Sea Gals perform a variety of dance routines during home games. Throughout the year a select performance team called the Sea Gals Show Group travels in parades, performs overseas and at home with the USO, and participates in events with other NFL Cheerleaders around the world. Wikimedia Commons has media related to Sea Gals. This article related to sports in Washington state is a stub. You can help Wikipedia by expanding it. This page was last edited on 10 November 2018, at 14:00 (UTC).